The story of Andrew Murray Vineyards is a fascinating one. In the early nineties, as an assistant winemaker, Andrew made his first bottle of wine in Australia before he was even legally able to drink. His parents bought some vineyard land in Santa Barbara and started a Rhone variety based winery with Andrew at the wine making helm and even named it after him. In his twenties Andrew was often mentioned in articles about hot new up-and-coming winemakers. As the popularity of California Syrah climbed upwards, so did Andrew Murray’s. He gained a lot of press early on, which was only compounded by his family’s mention in the movie “Sideways”. Andrew Murray Vineyards only seemed to have one direction to go: up. And for many years it did. Yet, as the fate of Syrah in California went sideways, the Murray family’s winery also changed course. In 2006, with his parents eyeing retirement, they decided to cash out the winery and the family’s vineyards. Andrew kept the winery name but parted ways with his parents (as far as business goes) and carved a space for himself among the warehouses of a former Firestone brewery building in the Los Olivos area. He began sourcing grapes from local vineyards and gradually picked up where he’d left off. In starting relationships with new vineyard sources Andrew had a chance to add different varieties to his repertoire but instead chose to keep making those Rhone varieties that he and his parents had fallen in love with when they started the winery back in 1990. Andrew’s first love was Syrah, and so it remains. He loves all iterations of Syrah and is proud of the fact that he has stuck with the variety even in the face of its perceived unpopularity in the last few years. In emailing back and forth with Andrew it was important to me to nail down some of his thoughts on current alcohol levels in Syrah. I wanted to get a feeling for whether or not he was attempting to dial back some of the alcohol levels in his wine to make them less big and to respond to the growing consumer appreciation for more elegant, nuanced styles of Syrah. I had also read a 2007 Chronicle piece by Olivia Wu that sort of pigeonholed Andrew as the “high-alcohol guy”. The article also mentioned that while Andrew personally liked wines that were of a leaner and more nuanced style, he often met distributors who put pressure on him to make big, hedonistic, fruit bombs which was the style of that time. I asked Andrew about his current thinking and about the 2007 article. I was a little worried if he would be sensitive about the alcohol comment after his wine was so famously denigrated as being too “hot” in its Sideways cameo. Andrew instead was gracious and thoughtful. Andrew Murray sent this wine to me as a sample because he thought it was his most cool-climate style Syrah. On first opening I was worried that for Andrew, cool-climate had a different meaning than it did for me. It’s an inky black wine and the color had me thinking that it was going to be Shiraz-like. But it turns out that Andrew was right — this is a wine with a fair amount of acidity and a lot of the cool-climate aromas and flavors. There’s a dry earth aroma along with some floral, plum, and hints of bacon. Bright strawberry and some brininess also come through on the nose for me. The palate is full but light on its feet with a great little punch of acidity on the finish. Those bright red fruit flavors carry through to the finish, and there’s also a bit of oak but it’s pretty integrated. I’m happy to report that this is a great example of cool-climate Syrah. This wine is co-fermented with 3% Viognier, which accounts for that deep dark color (see this blog entry from Tyler Thomas, winemaker at Donelan Wines, for more information on this process). It spends 18 months in French oak barrels, 20% of which were new. The Watch Hill Vineyard of the Los Alamos Valley near the Santa Ynez Valley gets a fair amounts of fog. In an email, Andrew expressed that Syrah is more than just a business for Andrew. “I have worked around the world with Shiraz in Oz and Syrah in Gigondas/Seguret…I love every iteration of Syrah, not just the cool climate ones…but this is my life…I would love to share some with you if would be open to it…” Although I was a bit worried that this wine would be a bit to over the top for me, I’m glad that I was open to it and I’m glad that Andrew was willing to share a bit of his life with me through this wonderful wine. I’ll admit that since I’ve started this blog, I’ve been quite surprised at how much more cool-climate Syrah there is in California than I’d previously imagined. I thought of myself as somewhat of an expert (thus, the blog) but I’m finding out there are a lot more wineries making cool-climate Syrah and my wine fridge is beginning to overflow with new and exciting finds. 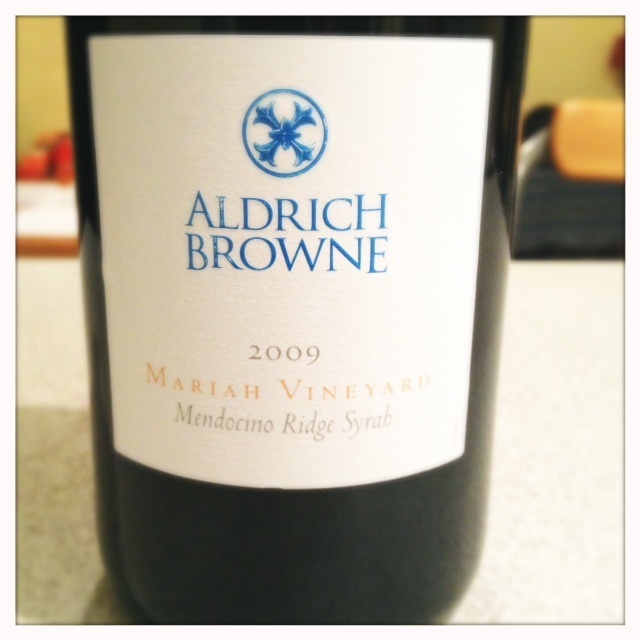 Aldrich Browne, for example, is a winery that was nowhere near my radar. My wife bought it as a birthday bottle for me at Draeger’s Market here in San Mateo. It turns out they make wine from the Mendocino Ridge appellation, also a Drew Wines vineyard source, and an area that is quickly becoming one of my favorite appellations for the kind of savory Syrahs that I love so much. These are high altitude coastal wines that really are grown on the edge of their ability to ripen. Like Peay Vineyards, Drew Wines, Wind Gap Wines, and Matello (in Oregon) these are grapes that take a long time to ripen and (in theory) develop more complexity because of the longer time that they hang on the vines. Aldrich Browne is the project of Ciara Meaney and Kimberly Ventre. Ciara has a background in wine and most recently worked in marketing for Jackson Family wines and then went on to the Culinary Institute of America to pursue her love of food and wine. Kimberly brings a marketing perspective to the project, having worked in marketing for Gap and then starting her own marketing consulting firm. Aldrich Browne is a start-up in every sense of the word and at this point Kimberly and Ciara do almost everything. Right now they are borrowing the winemaking facility of Peay Vineyards in Cloverdale. Aldrich Browne is keeping the name of their winemaker close to the vest right now and for whatever reason would not share his or her name. Hopefully I will be able to update this in the future. Ciara and Kimberly were drawn to the Mendocino Ridge appellation based on their love of Syrah from the Rhone region of France. They sensed that the appellation could offer the combination of fruit, spice, and acidity that would make the wine food-friendly. In Kimberly’s own words, they felt that Mendocino Ridge offered the possibility for “…more intense solar radiation combined with cooler climate (created) more spice, less berry, more complexity (and an) end product that is not so heavy and over bearing it becomes boring.” As you can tell, she is speaking my language. Aldrich Browne’s non-interventionist winemaking process is also an extension of their belief in making a Syrah that isn’t “heavy and overbearing”. They use larger 500 liter puncheons to make the wine, thus moderating the oak contact and they never use more than 20% new French oak. Right now, they add yeast but would like to explore using native yeast in the future. Additionally, they don’t add acid or sugar to this wine. The thing that strikes me so much about this wine right off the bat is how floral it is. I also smell the textbook plum, unripe blackberry, and olive tapenade aromas. There is also a slight herbaceous aroma, almost like celery or parsley, which when it’s enveloped in all that fruit, adds a complexity to the wine that I really enjoy. As I’ve mentioned before, cool-climate Syrahs are not wines with straight fruit, but rather fruit wrapped in other savory and interesting complexities. Their ability to bring some off-fruit aromas to the table really make them incredibly food-friendly. As the wine opened up I also got some strawberry aromas on the nose. On the palate the wine has smoky meat characteristics and a freshness that I really enjoy. It has some serious acidity and the crunchy tannins on the finish make my mouth dry, which again, is good for food. The tannins are definitely present but not too harsh and in fact, the finish is reminiscent of pomegranates mixed with plums. Does that sound good? I hope so, ‘cause it is. It’s neat to see a new winery taking the plunge and just making a cool-climate Syrah. This is a project where Syrah is not taking a back seat but rather is front and center and it will be exciting to see where the project goes from here. They plan to release a Perli Vineyard Syrah for the 2010 vintage and it will be interesting to compare it with the Donkey and Goat and Drew wines that I’ve had from the same vineyard. Onward and upward with Syrah! 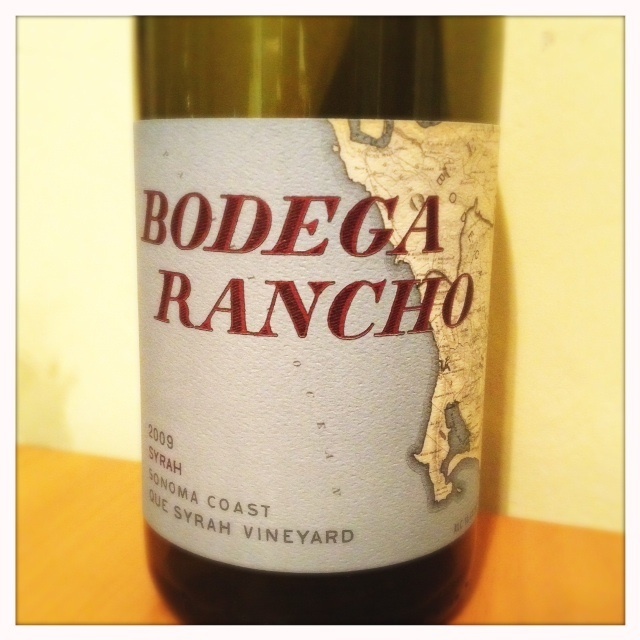 Bodega Rancho is one of those precious little California wine labels that you just want to squeeze and cradle in your hands and hold on to for your own. From its bucolic little tasting room in Occidental, arguably the cutest little town in Northern California, to its beautiful rustically-designed label, it seems to have maxed-out in the cuteness category. Plus, as an added bonus to pique my interest, they are farming grapes on the edge of their ability to ripen. I heard about Bodega Rancho from one of Lily-Elaine Hawk’s tweets if not for which I may have never happened across it. My wife and I happened to be heading for Bodega Bay the following weekend and we were able to make a short side trip to Occidental to Bodega Rancho’s little tasting room that they share with a winery called Boheme. The wineries are owned by brothers Kurt and Derek Beitler. Derek and Kurt both make their wine over in Napa at Caymus where they have some familial connections. Chris manages the vineyards and makes the wine for the Boheme label and Derek manages and makes the wine for the Bodega Rancho label. All the wines are well made and stylistically cool climate. According to the Beitlers, the Que Syrah vineyard is possibly the coolest-climate vineyard in all of California, check out my Tripline map to see how close it is to the coast. The Northern California fog blankets the vineyard in the morning and then eventually yields to sun in the afternoon. Ripening grapes here is a challenge that requires a lot of foliage trimming so that the grapes reach maximum sun exposure. 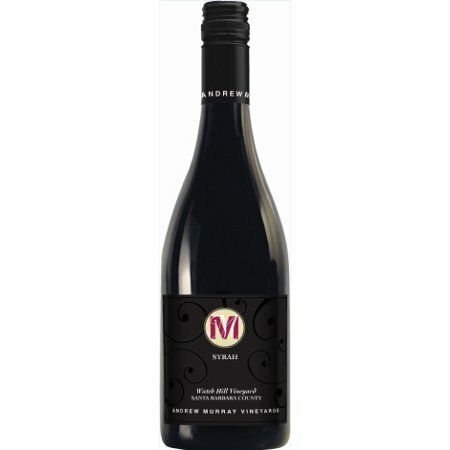 The wine: The Que Syrah Syrah has some textbook cool-climate aromas of black olive, minerality and bright berry aromas. There’s a hint of baking spices and vanilla on the nose which probably has to do with the oak treatment, and has the undesired effect of masking the fruit a bit. The palate is bright with a large amount of acidity. But the finish on this wine is what really gives it away as a seriously cool-climate Syrah. The acidity is acutely bright, so much so that it makes me think this wine could stand to sit for a few years to calm down a bit. Full disclosure: I love it, but I could see a consumer who is used to softer wines being a little shocked at this finish. This ain’t no Merlot. It’s got a serious lift of acidity that makes me think of less-than-ripe blackberries. As you can tell, I loved this wine but in a perfect world I would have actually liked to taste how this wine would have been with a bit less new oak. It was made in 100% French Oak (30% new) and I wonder if it would have developed more of a classically French style with neutral oak. Those baking spices that I got on the nose might dissipate a bit to allow the fruit to really sing. That being said, I’m no winemaker and my guess is that the Beitler’s thought this wine needed the oak to soften it a bit. All in all, this is a special wine and certainly a winery to watch in California. And, if you ever need a dose of perfectly pastoral Northern California, get to Occidental, and stop in to taste at their Cellar Door tasting room. You too will covet the experience.